A common side effect of the cold, dry, winter air is dry skin. This is extra-annoying to me, since I hate the greasy feeling of most lotions, so I usually just suffer with the itchy, cracked skin and pray for Spring to come early. Lately, I have gotten relief from this problem, plus lots of extra benefits. Scrubz sent me a jar of their sugar scrub in the scent April Showers to try, and it really works! I admit I was skeptical at first, as I had tried other (salt) scrubs in the past, which left my skin stinging and my tub an oily hazard area. Scrubz left my skin super soft with no greasy feel. It even got a “Wow!” out of my typically-neutral husband. The first time I used it, I kept rubbing my arms all day to feel my skin. Scrubz does its job by gently sloughing away dead skin cells, while the 8 natural oils trap and dissolve dirt and grime (quick science refresher: oil dissolves oil). Then, you rinse all the gross stuff away, leaving just enough oil on your skin to moisturize it all day long. 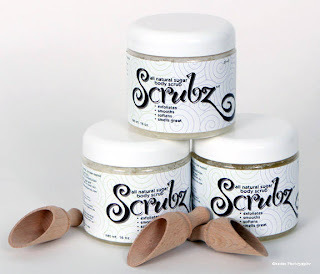 Scrubz is a 4-in-1 product that exfoliates and cleanses, moisturizes, and can be used as a facial scrub and a shaving oil. I was really scared to put the scrub on my very sensitive face (I have rosacea), but it did a great job. I had no irritation, just glowing, young-looking skin with no need for extra moisturizer. I was also pleasantly surprised when I used Scrubz to shave with. I got a really close shave. My skin was extra smooth, and I had no nicks, even in very sensitive areas. Besides smooth skin, I noticed other benefits of using Scrubz. Showering was way more fun, and the circular motion of exfoliating my skin was energizing, while the subtle scent left on my skin after the shower was relaxing. It also saves time because it eliminates the need to use multiple products. In that sense it can also save money! There are many scents to choose from, plus other products to try, like body butter, and “Scrubblez” for kids.